Several Chartiers Valley parents and former parents volunteered their time this week to share a colorful cultural experience with the Intermediate School. 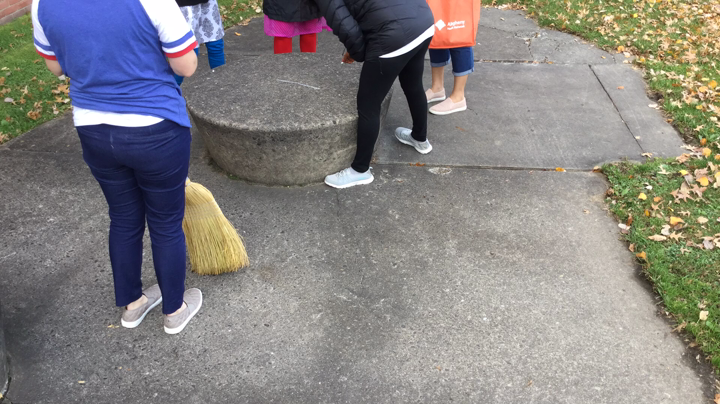 Four CV mothers -Shweta Gupta (Naresh, Grade 4), Rakshita Pooja (Nandishwaran, Grade 5), Shubha Agrawal (Aanya and Aadhya, Grade 3), and Richa Mishra (Aryaman, Grade 2) - created beatufiful rangoli patterns on the bench and sidewalk outside of the Intermediate School. Rangoli, often made with powdered rice, sand or flower petals is used to create colorful, chalk-like artowrk as a welcome symbol. This Hindu tradition is practiced during Diwali, a festival lights which celebrates the triumph of good over evil. In Mrs. Amanda Beckett's class several students dressed up in their new Diwali outfits and shared stories about how they celebrated Diwali in India and now in the United States. "We are so thankful for the time spent making the designs as well as teaching us about a part of their culture," Mrs. Beckett said.